Current calendar month, next 2 calendar months, and each February, April, August and October within 23-month period starting at current calendar month. Also each June & December within a 72-month period starting at current calendar month. (for gold futures deliverable in current month) 3r3rd last business day of the month. Note: On COMEX, contracts which are still open after the last trade date are either a) settled by delivery or b) liquidated by an Exchange for Related Position (EFRP). Current calendar month (for delivery purposes), next 2 calendar months, any each February, April, August and October within 23-month period starting at current calendar month. Also each June & December within 60 months of the current calendar month. 3rd to last business day of the contract month at 1:30pm New York time. The US gold market comprises both an active gold futures trading market and a large physical gold market. Although most famous for gold futures contracts that trade on the COMEX, other series of gold futures contracts also trade on the New York based Intercontinental Exchange (ICE), although neither exchange generates large amounts of physical gold deliveries. Beyond gold futures contract trading, the US gold market is also home to a genuinely large physical gold market comprising some of the world’s largest wholesale gold dealers and bullion banks, as well as extensive gold mining and gold refining operations. In addition to London’s OTC wholesale gold market, the US gold futures markets drives gold price discovery globally. 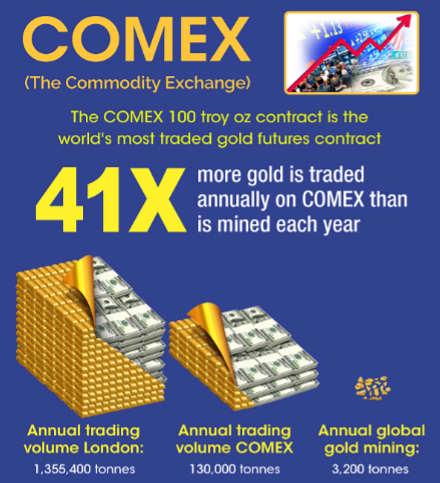 The vast majority of gold futures trade takes place on the New York based COMEX, which is owned by the CME Group. Competing gold futures contracts also trade on the ICE futures exchange. It’s therefore important to understand the genesis of COMEX and the other US futures exchanges on which gold futures contracts trade, or have traded in the past. Although the Commodity Exchange (COMEX) was founded in 1933, COMEX began trading gold futures on 31 December 1974 when the prohibition on private ownership of gold in the US was lifted. COMEX became a subsidiary of the New York Mercantile Exchange (NYMEX) in 1994. This led to the slogan – “NYMEX/COMEX. Two divisions, one marketplace“. The predecessor of NYMEX was founded in 1872 but the exchange only began using the name NYMEX in 1882. The Chicago Mercantile Exchange (CME) was founded in 1898 and has used the CME name since 1919. In July 2007, the CME merged with the Chicago Board of Trade (CBOT). The CME and CBOT then both became subsidiaries of ‘CME Group Inc’. In August 2008, the CME Group completed the acquisition of NYMEX (along with COMEX), and NYMEX became a fully-owned subsidiary of CME Group Inc.
COMEX, NYMEX, CME and CBOT are all subsidiaries of the CME Group Inc. All 4 of these exchanges are “Designated Contract Markets (DCMs)”. DCMs are designated and regulated by the US Commodity Futures Trading Commission (CFTC), under the Commodity Exchange Act (CEA). The New York Stock Exchange (NYSE) and Euronext merged in April 2007 to form NYSE Euronext. Euronext had acquired the London International Financial Futures and Options Exchange (LIFFE) in 2001 to form the Euornext.LIFFE futures exchange. Following the merger with NYSE, this futures exchange was renamed NYSE Liffe US. In March 2008, the NYSE Euronext group acquired CBOT’s precious metals contracts from CME, including 100 oz and mini gold futures, as well as options on gold futures, and NYSE Euronext added these products to the NYSE Liffe US portfolio. CBOT had traded a 100oz gold from 2004 and a “CBOT mini-sized” gold futures (33.2 ozs) from 2001. 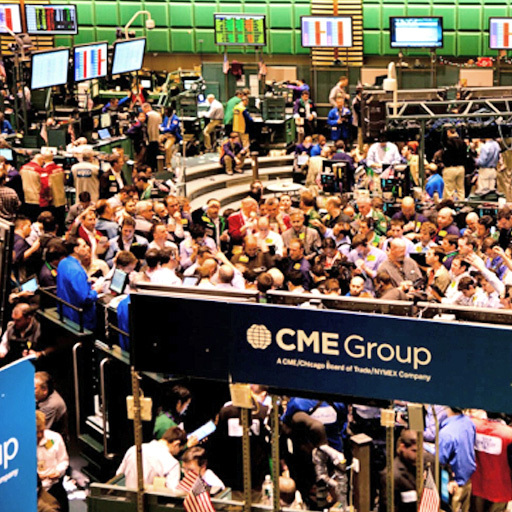 CME sold the CBOT products to NYSE Euronext just in advance of acquiring NYMEX/COMEX and its precious metals products. Intercontinental Exchange(ICE)  had also been attempting to acquire CBOT in 2007 at the same time as CME. ICE then acquired NYSE Liffe in 2013, and transferred the NYSE Liffe US precious metals contracts to the ICE Futures US platform in 2014. ICE then spun off Euronext in 2014. ICE Futures US was itself formerly known as the New York Board of Trade (NYBOT). ICE acquired NYBOT in January 2007 and renamed it as ICE Futures US in September 2007. ICE Futures US is also a “Designated Contract Market”, and is regulated by the Commodity Futures Trading Commission (CFTC). A gold future contract is a contractual agreement to deliver/receive a specified quantity of gold, of a specified quality, on a specific future date. One party to the contract is said to be long, the other party is said to be short. A futures contract is created when a buyer and a seller enter the contract. The Open Interest (OI) is the number of futures contracts in a given contract specification, outstanding at any given time. Four gold futures contracts trade on COMEX, namely COMEX 100 Gold Futures, miNY Gold Futures, E-micro Gold Futures, and Kilo Gold Futures. The Kilo Gold Futures is technically a Hong Kong product. Two gold futures contracts trade on ICE US, namely, ICE 100oz gold futures and ICE Mini Gold Futures. Since November 2015, ICE, through its ICE Singapore exchange, also lists a one-kilo gold futures contract. CME hosts options on its 100 Gold Futures Contract (code OG). ICE hosts options on its 100oz gold futures (code ZG) and options on its Mini Gold Futures (code YG). The 100 oz gold futures (GC) is CME’s highest volume metals contract, and it also registers the highest volume of all CME precious and base metal futures. Generally, over 90% of volume on the Comex 100 oz contract (GC) goes through the Globex platform, with the remainder of the volume on ClearPort, and practically no volume via Open Outcry (0.01%). CME’s miNY Gold Futures contract (QO) trades very low volume. Likewise, CME’s E-Micro Gold futures contract (MGC) registers very low trading volumes. Volume on the ICE Futures US exchange is minimal, and the 100oz contract often sees no volume. Likewise, the ICE Mini gold contract is relatively inactive, with daily volume of about 1000 -1500 contracts. Since most of their gold futures contracts are physically deliverable, the CME and ICE each maintain an official list of approved depositories (vaults) which are licensed by the respective exchanges to store precious metals (gold, silver, platinum and palladium) that meet the requirements of the exchange’s contracts. Each of these CME and ICE vault facilities is located either in New York City, or within about a 150 mile radius of New York City. Scotia Mocatta: 23059 International Airport Center Blvd., Building C, Suite 120, Jamaica, NY. Both CME and ICE publish reports at the end of each trading day which show warehouse inventories of gold in the approved facilities/depositories that meet the requirements for delivery against the Exchanges’ gold futures contracts. The inventories are reported in two categories, eligible gold and registered gold. Eligible gold is all gold residing in a warehouse (vault) which is acceptable by the Exchange for delivery against its’ gold futures contracts. This would include 100oz bars and kilo bars, but not 400 oz bars. Criteria for acceptability by the Exchange would include acceptable weight, acceptable minimum fineness and approved refiner. Eligible gold just happens to be gold that is residing in the approved facilities that meets the eligibility requirements of the Exchanges. It does not necessarily mean that the gold is in the approved vaults for trading purposes. Some of it may be left in the vaults by owners who are trading COMEX or ICE gold futures, but other eligible gold could be deposited in the approved vaults for lots of other reasons unrelated to gold futures trading on the Exchanges. Registered gold is eligible gold for which a warrant has been issued by the warehouse. A warrant is a ‘document of title’ issued by the warehouse in satisfaction of delivery of a gold futures contract. It confirms title to a certain quantity of gold of acceptable quality that is stored in that warehouse. A warrant will specify a certain number of bars, the serial number of the bars and the bar brands. For vaults which CME and ICE both use, the gold totals (of eligible + registered) will, by definition, be identical on the CME report and the ICE report, since it’s the same gold being reported on. Only registered gold totals will differ, since these figures represent the warrants issued against each Exchanges’ gold futures contracts. The different registered totals for COMEX and ICE will make the eligible totals slightly different. HSBC, Scotia and JP Morgan consistently maintain the largest eligible gold inventories, compared to the other warehouses. All gold arriving into and departing from the approved warehouses’ vaults that’s connected to the exchange, including gold transferred between warehouses, has to be transported by Exchange Approved security carriers. The CME Group has approved Brinks, Loomis, G4S, Malca Amit, and IBI Armored Services as approved carriers for transport activity to, from, and between approved gold warehouses/vaults in the New York and surrounding area. If a contract holder was taking delivery of a gold contract out of an approved warehouse, the holder would contact the exchange (CME or ICE) and request physical delivery. The exchange would then assign that delivery to a specific warehouse. The party taking delivery would have to pay delivery costs and transport and insurance also. On a futures (and options) exchange, open interest (per futures type) is defined as the total futures and/or option contracts entered into that have not yet been offset by a transaction, by delivery, or by exercise. By definition, the aggregate of all long open interest = the aggregate of all short open interest for that futures contract type. Participants in futures trading can be viewed in terms of their motivation for trading, i.e. as a hedger or as a speculator. Hedgers may, for example, use futures to hedge price fluctuations, hedge financial risk, or hedge a cash market position using a futures market position. Futures participants can also be viewed in terms of trader type, e.g. clearing members or brokers. Using COMEX as an example (since COMEX is the most active exchange for gold futures), all trades on COMEX are technically undertaken between the CME Group and the clearing members. There are approximately 50 active clearing members on COMEX. However, the original trades could have been initiated by individual traders, brokers, or clearing members. The Commodity Futures Trading Commission (CFTC) publishes a closely watched report each week called the Commitment of Traders Report (CoT) which is based on futures and options positions data submitted daily by ‘reporting firms’. Reporting firms include clearing members, futures commission merchants and brokers. Reporting is triggered by thresholds of reporting ‘levels’ which are set by the CFTC. The CoT report includes commodity markets where 20 or more traders hold reportable positions. If a trader or trading entity has a reportable position in any commodity in any single month (in either futures or options), that trader or trading entity must report its entire position in all months across futures and options. The open interest totals are analysed by the market in conjunction with price direction sp as to try to ascertain signals about market condition. For example, if the price is rising and open interest is also rising, this could signal new longs entering the market and would be interpreted as bullish for the gold price. For gold, the Commitments of Traders (COT) reports open interest each Tuesday on contracts of 100oz troy ounces on Comex and ICE. The CFTC maintains that traders’ reported positions captured by the CoT report account for between 70-90% of the open interest in each commodity. Until recently, the CoT report classified traders into commercial traders (who use futures for hedging purposes), and non-commercials (speculators), with a third category called non-reportables (which would include commercials and non-commercials). One useful feature of the CoT report, by market convention, is to analyse the non-commercial (speculator) positions, so as to gauge their aggregate net long or short position in a commodity. Recently the format and categories of the CoT report were made more granular and now the report includes swap dealers. In the short version of the revised CoT report, there are now 4 category names: ‘Producer/Merchant/Processor/User’, ‘Swaps Dealers’ (both of which were previously in the “Commercials” category), ‘Managed Money’, and ‘Other Reportables’ (previously in non-Commercials). ‘Producer/Merchant/Processor/User’ refers to would be physical commodity producers/processors/users who use futures to hedge their exposures. ‘Swap Dealer’ would be commodity swap dealers, also using futures to hedge, but in this case, hedging swaps transactions. These swap transactions would have the producer category and speculators as counterparties. ‘Managed Money’ covers Commodity Trading Advisors (CTAs), Commodity Pool Operators (CPOs) and other commodity funds. ‘Other Reportables’ is any reportable trader that is not classified within one of the other categories. The long version of the revised CoT report also includes the percentage of Open Interest held by the largest 4 and largest 8 trading entities. This is a metric of market concentration and shows how influential a small number of trading entities are, or are not, within that particular commodity futures contract. The long version also includes a ‘Non-Reportable” category, the positions of which represent total Open Interest minus all the other 4 categories. The CFTC issues a report called the Bank Participation Report (BPR) dated the first Tuesday of each month, that is usually released the following Friday. The BPR reports positions of reportable traders that have been classified by the CFTC into ‘US Commercial Bank’ and ‘Non-US Commercial Banks’. The BPR includes 4 US Banks and 18 Non-US Banks, and shows the aggregate gross long position of these entities (and as a percentage), the corresponding short market position (and percentage), and the total OI of these entities. The identities of the individual banks reported on are not revealed. For example, 4 US Banks might in aggregate be long 9,000 futures and short 39,000 futures while 18 non-US banks in aggregate might be long 36,000 futures and short 44,000 futures, in a contract where the total OI might be 435,000 contracts. Note that the Commitment of Traders report and the Bank Participation report are both extracted out of the same CFTC database because they are based on the same set of data that the exchanges report to the CFTC. The CFTC calls its database the “large-trader reporting system database“. According to the US Geological Survey (USGS), domestic gold mining production (in the United States) totalled 200 tonnes in 2015. The biggest gold producing state by far in the US is Nevada, followed by Alaska, with all other producing states combined in a distant 3rd to Alaska. The largest US headquartered gold mining producer is Newmont Mining. Newmont is a member of the World Gold Council. In 2014, Newmont produced 4.85 million ounces of gold (151 tonnes) globally. In its 2014 annual report, Newmont states that 23% of its gold sales went to the Bank of Nova Scotia, and 17% to Barclays. In 2015, Newmont produced 5.04 million ounces of gold globally. According to USGS data, US gold imports in 2015 reached 265 tonnes, and US gold exports totalled 500 tonnes. Taking July 2015 as an example to illustrate the main destinations of gold exports and the main sources of imports, 37 tonnes of refined bullion were exported from the US in July 2015, of which 20 tonnes went to Switzerland, 8 tonnes to UK, and 7 tonnes to Hong Kong. Furthermore, 12 tonnes of gold doré were exported in July, of which 6.3 tonnes was sent to Switzerland, 4.3 tonnes to India and 1.1 tonnes to the United Arab Emirates. A number of large precious metals refineries operate in the US including Metalor USA Refining Corporation, in North Attleboro, Massachusetts, Heraeus Precious Metals North America in Newark, New Jersey, and Asahi Refining (formerly Johnson Matthey) in Salt Lake City, Utah. Johnson Matthey’s precious metals refining operations in Salt Lake City and Brampton, Canada, were sold to Asahi Holdings of Japan in 2014, and the name of the refining business was changed to Asahi Refining. In addition to the large refiners, the US precious metals refining sector includes some smaller refiners such as Sunshine Mining in Idaho, Republic Metals Corporation in Florida, Elemetal Refining in Ohio (formerly known as Ohio Precious Metals), and United Precious Metal Refining in Alden, New York. The US Mint, part of the US Department of the Treasury, operates gold coin production facilities across four locations, in Philadelphia (PA), Denver (CO), West Point (NY) and San Francisco (CA). Proof and uncirculated gold coins are available to purchase directly from the Mint, however American Eagle and American Buffalo gold bullion coins (made for investment purposes) are only available from bullion dealers. The US Mint used to publish a specific list of authorised purchasers (dealers) which it had appointed to distribute its bullion coins, but it no longer makes this list public. However, most of the large precious metals wholesalers that were previously authorised are still de facto authorised, and recent such lists have included US based HSBC Bank, Prudential Securities, A-Mark, CNT, Dillon Gage, MTB, and Fidelitrade (See below for US gold wholesalers). CNT, A-Mark, LeachGarner, and Sunshine Minting are also authorised sellers of gold to the US Mint for use in the Mint’s gold products. The US Treasury states that it owns 261.5 million ozs of gold, of which 248 million ozs is stored in US Mint storage facilities in Fort Knox, Kentucky (147.3 million ozs), West Point, New York (54 million ozs), and Denver, Colorado (43.8 million ozs). The remainder is said to be stored at the Federal Reserve Bank of New York (13.4 million ozs) and as working stock for the US Mint (2.8 million ozs). For more information about US Treasury gold, see BullionStar blog article “Where Did The Gold In Fort Knox Come From? Part One“, and “A First Glance At US Official Gold Reserves Audits“. The FRBNY gold vaults in the basement of the Federal Reserve’s building at 33 Liberty in Manhattan hold some 6,700 tonnes of gold on behalf of approximately 36 central banks, foreign governments, and international organisations such as the International Monetary Fund, Bank for International Settlements and the European Central Bank. For in-depth background on the gold vaults of the New York Federal Reserve, see BullionStar blog articles “The Keys to the Gold Vaults at the New York Fed” Part 1, Part 2 and Part 3. There are a number of well-known full-service precious metals wholesalers operating in the US gold market, the largest being A-Mark, Dillon Gage, Coins ‘N Things (CNT) and Manfra, Tordella & Brookes (MTB). Note that these 4 companies are also extensively involved in supplying gold bars and coins to the international (non-US) market also. A-Mark, established in 1965, is the largest precious metals dealer in North America. It’s headquartered in Los Angeles, with an operation in Vienna, Austria, and it provides precious metal trading, leasing, storage, consignment, and financing, and is an Authorised Purchaser of the US Mint, and official distributor for many other government Mints. A-Mark does not sell to the retail public. Coins ‘N Things (CNT), established in 1973, is headquartered in Massachusetts and is the largest wholesale seller of gold in the US, and notably, the largest supplier of precious metals to the US Government, as well as being the largest contractor to the US Treasury Department. CNT also runs its own storage facility called the CNT Depository. Note that CNT does not have a public internet site. Dillon Cage, established in 1976, is headquartered in Dallas, Texas, and is one of the largest wholesale precious metals trading firms in the world. It’s an Authorised Purchaser for the US Mint and other major government mints, and runs its own precious metals refinery (for scrap), as well as owning International Depository Services of Delaware (IDS). Manfra, Tordella & Brookes (MTB), established in 1957, based in Manhattan, New York, is a larger wholesale precious metals company owned by MKS Group of Switzerland. MKS also owns the large Swiss PAMP gold refinery. MTB is an Authorised Purchaser of the US Mint and other government mints, and operates its own vault which is COMEX and ICE approved. All 4 of the above dealers are Associates of the London Bullion Market Association (LBMA), as is MKS, the parent company of MTB. Note that the ICE exchange has therefore approved vaults of 3 of the large US gold wholesalers, i.e. CNT, MTB and IDS (owned by Dillon Gage), whereas CME/COMEX has approved the MTB and IDS vaults. A wide variety of investment banks are involved in the New York gold market. A number of these are US headquartered investment banks that are active participants in the global gold market including JP Morgan Chase, Citibank, Goldman Sachs, Morgan Stanley and Bank of America. This is more readily highlighted by looking at the presence of these banks in London, through their membership and activities in the London Gold Market via the LBMA, but they are also actively involved in the gold market in New York. For example, Goldman Sachs, JP Morgan Chase, and Morgan Stanley are direct participants in the LBMA Gold Price auction in London. Goldman Sachs, JP Morgan, Morgan Stanley, Citibank and Bank of America’s Merrill Lynch International are LBMA market makers in London, and Bank of America itself is an Ordinary Member of the LBMA. JP Morgan is also a member of London Precious Metals Clearing Limited (LPMCL) and operates a precious metals vault in London. In the New York gold market, JP Morgan, along with HSBC and the Bank of Nova Scotia all operate precious metals vaulting facilities which are approved for delivery for COMEX and ICE gold futures contracts, and these three banks actively trade in the COMEX 100 oz gold futures contract – see COMEX issues and stops report. Although HSBC is London headquartered, its US subsidiary, HSBC Bank USA, acquired its New York precious metals business through the acquisition of Republic Bank of New York in 1999 and it operates its precious metal vault from midtown Manhattan. The Bank of Nova Scotia, headquartered in Canada, runs a precious metals vault adjacent to JFK Airport, after having had to move following the damage to its previous vault in 2001 in the World Trade Center complex in Manhattan. JP Morgan operates its very large precious metals vault at a location in Manhattan adjacent to the New York Fed building, under 1 Chase Manhattan Plaza. The sizeable physical gold market in the US unfortunately often gets overshadowed by developments in the COMEX gold futures market. The US gold market is not just COMEX futures, and outside of COMEX, the physical gold market in the US is relatively large and comparable in scale to other sizeable gold markets around the world. The subject of COMEX gold futures trading volumes and open interest versus the quantity of gold in the COMEX approved warehouses continually generates significant debate and media coverage.This is primarily because the COMEX futures gold price is an important contributor to price discovery in the determination of the international gold price, and also because the level of gold deliveries from COMEX gold futures trading is very minimal in relation to trading volumes. Gold futures trading in New York is predominantly used for price hedging and speculation, and nearly all positions in an upcoming expiring contract are exited or rolled over before first notice day, so the need for a short contract holder to deliver even a warehouse warrant/receipt is minimal. Debate often focuses on the level of ‘registered stocks’ but this is not entirely correct since delivery, if needed, could technically be met from a portion of ‘eligible stocks’ or from delivery into the warehouses from the wider gold market. Debate also often focuses on ‘eligible stocks’ being somehow exclusively related to COMEX. This view is also incorrect because ‘eligible’ gold is not necessarily connected to or under the ownership of participants engaged in gold futures trading in either or any gold futures activity. Perhaps a better question to ponder is why the world gold price is so heavily influenced by COMEX gold futures prices in the first place.